Spot Cool Stuff is freshly back from the Summer Outdoor Retailer convention in Salt Lake City where, along with approximately 20,999 others, we ooo-ed and ahhh-ed over the latest tents, backpacks, kayaks, shoes, bicycles, roof-top carriers, portable disposable toilets (yes, really), sunglasses, jackets, pocket knives, hammocks, energy bars, hiking GPS units and an assorted sundry of outdoor gear and gadgets. It might have been the product that amazed us most at the OR Show: The Terra Nova Ultra 1 Tent. The “1” in the name could represent the number of people the tent sleeps comfortably. Or it could represent the weight: 1 pound and 1 oz. That’s about the same weight as a medium cup of take-out coffee! And it makes the Ultra 1 the lightest double-wall tent in the world. You’d think that such a light tent would be both absurdly flimsy and miniscule. In fact, the design, which relies heavily on rope tension, feels study. The interior—7.2 feet (220cm) long by 2.4 feet (74cm) at its widest point—has enough room for two (small) people to squeeze in. We also like the overhang between the interior and exterior tent walls for storing shoes and gear. Available spring 2011 . . .
. . . but if you can’t wait, the excellent Terra Nova Laser Photon Elite Tent is available now; it weighs only 9.5 ounces more than the Ultra 1 but costs considerably less.  Assuming your coffee is 16 ounces (roughly 470ml) and comes in a paper cup. 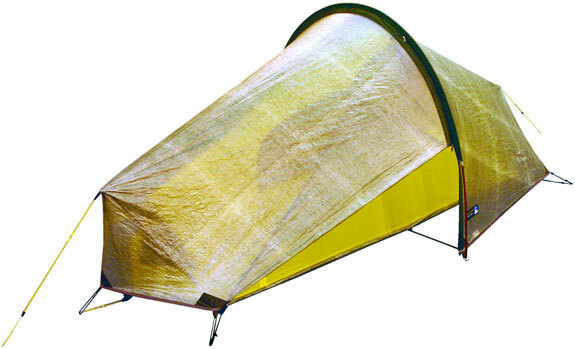 What would make the perfect companion to the world’s lightest double-wall tent (above)? How about the world’s lightest camping pad. The Inertia X-Frame sleeping pad resembles a flotation device with holes in it. Those holes, though, are strategically placed away from pressure points. When Spot Cool Stuff tried it out, what surprised us most was how comfortable we were when laying on our side as well as our back. Counterintuitively, the holes in the Inertia X-Frame also help provide warmth since your sleeping bag fills in those gaps and traps warm air there. The large-size Inertia X-Frame weighs a scant 9.1 ounces (258g) or less than half that of the current lightweight sleeping pad market leader, the Therm-a-Rest NeoAir. Pre-orders available now; ships October 2010. 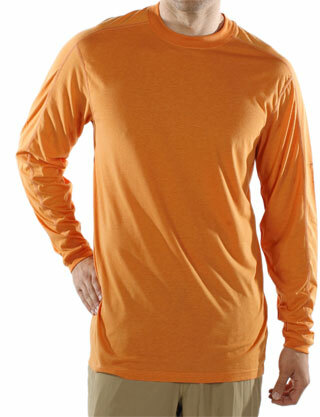 There’s no shortage of garments that claim to be breathable, quick drying and moisture wicking. Sol Cool, from ExOfficio (a Spot Cool Stuff fave), is the first clothing line we know of that claims it will actively cool you. Sol Cool apparel is treated with xylitol (“zie-le-tawl”), a natural sweetener derived from birch trees. The idea being that wearing a Sol Cool shirt will keep you cooler than wearing any other shirt—or no shirt at all. So, does the Sol Cool claim stand up to reality? Spot Cool Stuff tried out one of their shirts on a dry 90°F (32°C) Utah afternoon and was impressed enough to include it in this roundup. We’ll be conducting a field test of the Sol Cool claim in the tropical heat of Costa Rica shortly—check back on our travel blog for that. Available at exofficio.com on January 1, 2011 (give or take a week). Traveling with an iPod, cell phone or hand-held GPS? With the creatively-capitalized nPower PEG you may have no need for electricity, nor sun to alight solar panels, nor extra batteries. 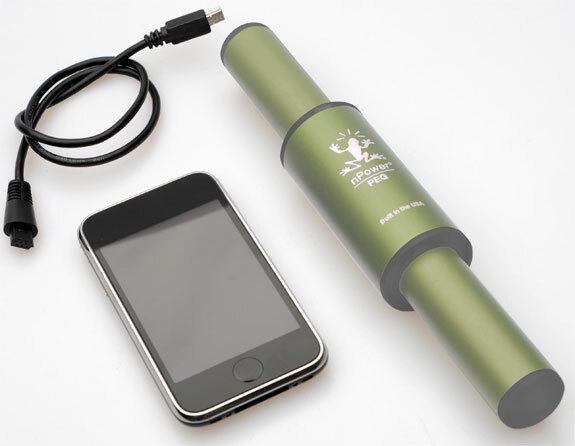 The nPower PEG is the world’s first consumer kinetic energy charger for hand-held electronics. Carry this 12 oz (340g) rod-looking device with you while hiking, running or even driving on rough roads and the motion created inside the nPower PEG will charge its internal battery. The nPower PEG even “knows” what sort of activity you are engaged in and will automatically adjust the efficiency of its electricity generation. When you are ready to recharge your portable device plug it into the nPower PEG by way of a USB cord or an iGo adapter tip. The amount of electricity the nPower PEG generates varies greatly by activity. According to the manufacturer, one minute of walking with nPower PEG will produce enough juice to power an iPod Nano for one minute; it takes roughly 10 minutes of walking to power 1 minute of talking time on an iPhone 3GS. The startmonkey200, from the cool seller of mobile charging solutions PowerTraveller, is the world’s smallest and lightest car jump start system. 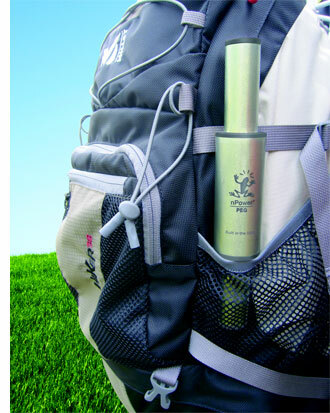 The device weighs a mere 1.4 lbs (660g) and is about the size of a water bottle. In that compact package there’s enough power to jump start a car eight times! The abundance and quality of portable solar chargers was a pleasant surprise at the Outdoor Retailer show. One of the companies that stood out was Goal0. (That’s “Goal Zero”, not “Goal-Oh”). Their excellent Sherpa 50 Adventure Kit includes a powerful battery wrapped in a set of durable, waterproof solar panels. In full sunlight, the battery can charge in about 8 hours and stores enough juice to run an iPod for nearly a week of nonstop play! And the whole system weighs only 4.2 lbs (1.9kg). 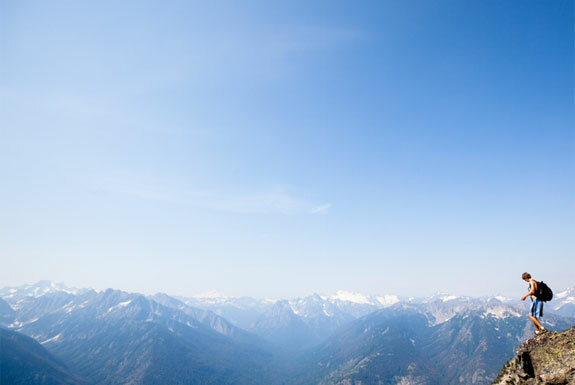 So, what if you want a solar charger that’s even smaller and lighter? Enter the Nomad 7m. It weighs a scant 13 ounces (368g) though, unlike Goal0’s Sherpa chargers, the Nomad doesn’t include a battery. Instead you charge directly from the sun. Place the Nomad solar panels out on the ground, or hang it from the back of your pack, place your electronic device in the Nomad’s pocket and voila. 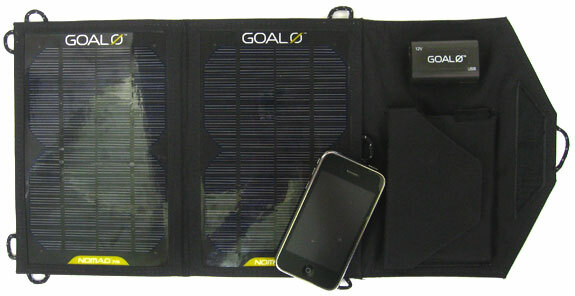 According to Goal0, the Nomad 7m can charge a typical cell phone in 1 hour, an iPod in 2 hours and a GoPro HD camcorder in 4 hours. Available in August/September of 2010. Water, water everywhere . . . and plenty of water bottles to drink it from. No other product single product had as many companies at the Outdoor Retailer Show dedicated to its manufacture as did water bottles. The new producer that stood out most to Spot Cool Stuff: Liberty Bottleworks. In addition to being the only water bottle made from 100% recycled aluminum, Liberty also had the only bottles that are 100% American made. That is, all of the manufacture and all the source material used in the manufacture is American. 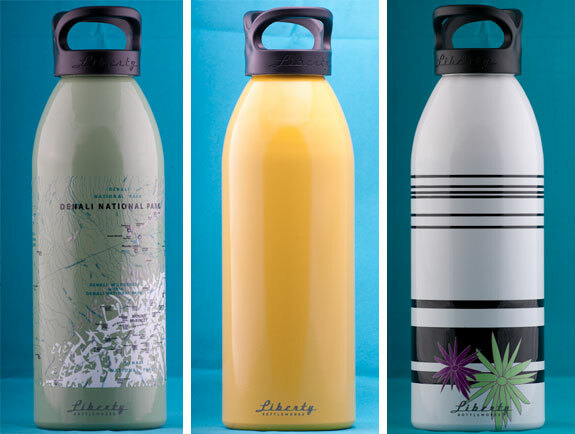 Other qualities of Liberty water bottles that appealed to us: They have a patented no-splash edge, their exterior—as well as interior—is BPA-free and they are dishwasher safe. Also cool: Liberty has contracted with local artists to come up with bottle designs. Those designs are printed using a six-color cylindrical printer. That printer can layer the colors such that, on a topographic map of the mountainous Denali National Park, for instance, you can feel the ridges; see left photo, below. Did you know that thieves are able to steal your credit card without ever touching it? Without you even using it? If your credit card is equipped with an RFID chip, someone with a hand scanner can steal all of your card details simply by standing near you, while you are standing in line at the store, for example. And it isn’t only credit cards that are at risk. Passports with RFID chips contain your travel history. Corporate IDs with RFID chips hold your personal information. The Electronic Privacy Information Center calls the issue of RFID theft a serious problem. And that’s lead to an emerging need for RFID wallets. There are several RDIF-safe wallets already on the market; most are either made aluminum or possess dubious RFID-blocking properties. 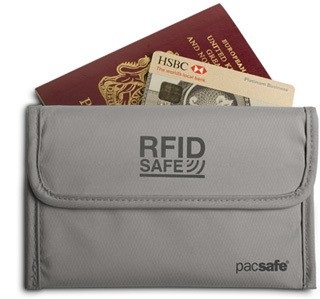 The PacSafe SFIDsafe 50 wallet stands above because of the material it is made from: a rip-stop conductive fabric integrated with a hot melt adhesive film comprised of a nickel and copper weave. About a year ago we compared what were then the two best value waterproof compact digital cameras: the Canon PowerShot D10 and the Olympus Stylus Tough-8000. Now, there’s a new camera in that class to consider: the Pentax Optio W90. The Optio W90’s 5x optical zoom surpasses that offered by the aforementioned Canon and Olympus models; the W90 also weighs less. 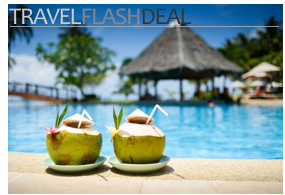 It is waterproof, dustproof, shockproof, freezeproof and—perhaps most crucial for beach-goers—sandproof. Perhaps the coolest feature of the Pentax Optio W90: the Digital Microscope mode. The W90 can shoot macro photos from as little as 1 inch (25mm) away. Three LED lights around the lens illuminate close-up objects allowing for surprisingly stunning macro photography in dark hidden-away places. 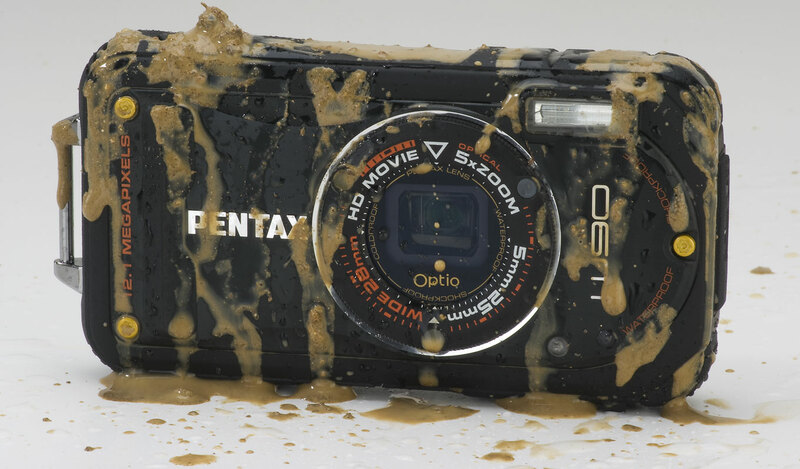 Update: Read our full review of the Pentax Optio W90 waterproof ultra-compact digital camera. At the end of our review of the best iPhone and iPod waterproof cases we suggested readers who do accidentally drop their portable electronics in water immediately place their waterlogged device in a bowl of rice. That’s because rice is especially water absorbent. Well, we are now changing that advice. 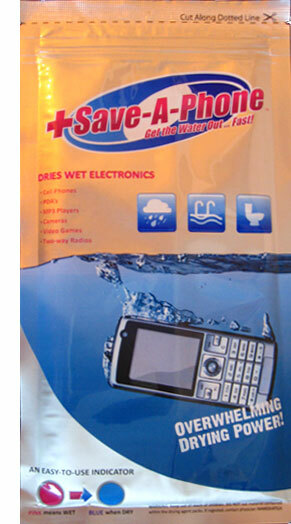 If your portable electronics get wet we now suggest placing it in a Save-A-Phone. The interior of this pouch is so good at absorbing moisture that it can draw water away from rice. The Save-A-Phone requires between 24 and 72 hours to dry your electronic item back to life; color coding inside the pouch will advise you of the progress. Save-A-Phones are sold as one-use items but they are strong enough to reuse a few times. Though if you are consistently dropping your gadgets in the water, you may have other issues. The small Save-A-Phone (eg. for iPods, cell phones, compact cameras) is available now. A larger pouch (eg. for iPads, netbooks) will be available winter 2010. The majority of our readers have probably bought multiple pairs of earbud headphones and found a majority of those uncomfortable. People who exercise with earbuds struggle with an additional issue—not only are in-ear headphones generally uncomfortable but they are prone to falling out. Yurbuds earbuds solve both issues. Yurbuds ear coverings (the company calls them “earbud enhancers”) are made of a soft, comfortable plastic and come in a variety of sizes. If you don’t know your size you can consult the Yurbuds website or download their cool iPhone app. Once you get a proper-sized pair of Yurbuds they won’t fall out even when you try jarring them loose by shaking your head. The problem with the standard Yurbuds earphones is that the sound quality they deliver is, shall we say, slightly above adequate. Not bad, certainly. And probably good enough for casual listeners. But not up to the expectations of audiophiles. 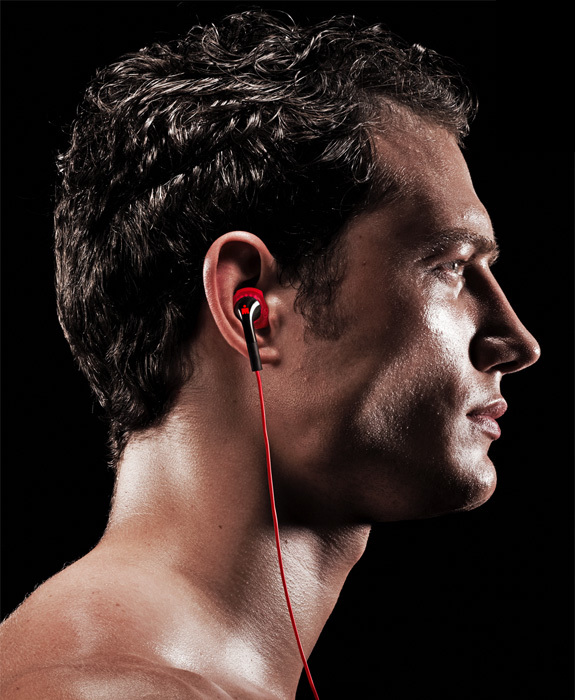 That will change with Yurbuds’ new Ironman Performance Raising Earphones. The sound they produce is rich, especially at the base notes. That, while keeping the comfortable in-ear piece of the regular Yurbuds earphones. Ironman earphones will ship with size 5 and 7 earpieces—that should work for about two-thirds of the adult populations. Those with other ear sizes can purchase a pair of earbud enhancers separately. Pre-order available now. Ships August 23rd. The beach-rich Indonesian island of Bali has, sadly, whole landfills full of used tires. At least one company is finding a way to make good use of them. 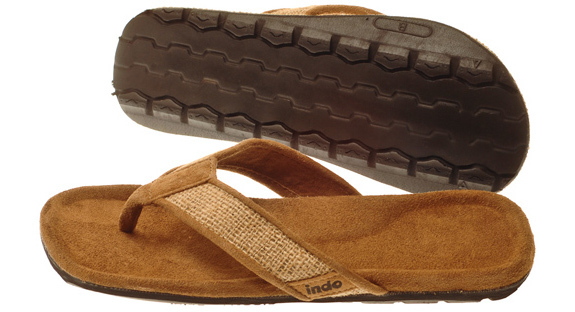 Indosole is employing local Balinese to cut off the tread of old tires and then to sew them onto the bottom of soft, comfortable sandals. Theirs are not the only footwear made using recycled materials; usually, though, those materials are reconstituted. Look at the bottom of a pair of Indosole sandals and you can literally see the tire tread and sense the years of road wear they’ve had. Comfortable, great looking and environmentally friendly—it is hard to find a better Spot Cool Stuff combination than that. Yeah, these are cool gadgets and gears and they are useful too. But what’s with the wallet? 😀 Well, days are fast and everything keeps on improving so that is the same with these outdoor gears.